I love to plan all sorts of events, but National Grandparents Day celebrations are a special favorite of mine. It’s nice to see families honor their grandmothers and grandfathers on this special day. I always ask my clients about the preferences of the people they want to celebrate. For instance, do the grandparents enjoy large parties with lots of friends or, do they prefer small, informal gatherings? I want to make sure that the grandparents will have a great time at their September celebration. So this week, I’m sharing a few of my ideas for Grandparents Day celebrations that are sure to please both grandma and grandpa. This informal Grandparents Day celebration makes for a relaxing, fun time for everyone. Both the adult children and the grandchildren can help out with the preparations. I advise the family to reserve a few picnic tables beneath a gazebo in a local park. Simple decorations include tablecloths in fall colors for the picnic tables and colorful balloons to hang on the gazebo. 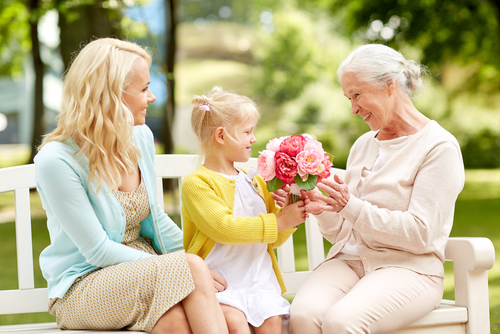 Flowers are a perfect addition to a Grandparents Day celebration in the park. A basket of sunflowers serves as an appealing centerpiece on a picnic table and the grandparents can take it home to enjoy after the party. Alternatively, a collection of colorful roses in a beautiful vase brightens any gathering and is sure to please grandma. The family can grill hamburgers, hot dogs, or chicken, whatever picnic food the guests of honor favor the most. Along with the potato salad, baked beans and coleslaw, the grandchildren can be in charge of making a cake with the help of their parents. I suggest making a basic cake recipe, then allowing the grandkids to decorate the cake with the faces of their grandparents! They can use sprinkles, frosting and small candies to make their design. The sillier, the better! In my years of helping to plan National Grandparents Day celebrations, I’ve noticed that gifts and desserts made by grandchildren are always a big hit with grandparents. Some of the most appealing ideas for Grandparents Day celebrations involve grandma and grandpa’s favorite eatery. I suggest that families reserve a private room at the restaurant to accommodate the celebration. In many cases, the family can call ahead to arrange for a particular meal. After a wonderful meal, family members can give their gifts to grandma and grandpa. Once again, I advise parents to help the grandchildren make a Grandparents Day gift with special significance. For instance, if the grandparents are big readers, kids can make bookmarks that feature photos of themselves and family members. Or, they can make collages with pictures of themselves with their grandparents. Parents can purchase a nice frame for the collage at a craft store. This makes for an especially memorable Grandparents Day gift.